The Flying Man is back ! On September 26, 2008, Yves Rossy became the first person to fly across the English Channel using a jet pack, his self-designed jet-propelled wing. 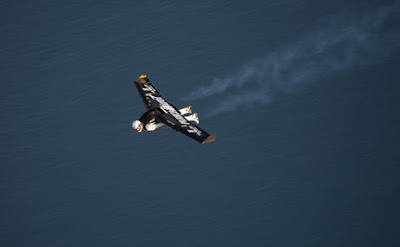 Yves Rossy, aka Jet Man, zoomed into the record books Friday, flying across the English Channel strapped to a single jet-powered wing, with only a helmet and flight suit for protection. The 22-mile (35-kilometer) France-to-England journey took 10 minutes.